CUDDLES is a beautiful little girl and like her brother Flash, she is blue in colour with the most gorgeous eyes which will melt your heart. She is clean in her kennel and walks beautifully on lead. She is very like her brother in temperament and has a loving, sweet nature. When she is a little unsure, she looks to her brother for reassurance. 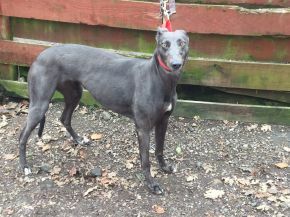 She adores being groomed and cuddled and will make the most fantastic addition to your family. Like Flash, her confidence and character will blossom in a quiet environment through time, patience, care and love and we would like to rehome her with her brother.